Everything about the Bose QuietComfort 35 focuses on the ease of listening. With commendable audio reproduction, fine active noise cancellation, a decent build and good battery life, the Bose QuietComfort 35 is right up at the top of our recommendation charts. It slightly lacks in terms of the peppiness of audio, and this leaves the Sony MDR-1000X as the more exciting among the two, although it may come across as slightly harsh, in comparison. All things considered, the Bose QuietComfort 35 presents the best overall package for everyday listening, offering premium auditory experience at a hefty premium of Rs. 29,363. Wireless audio has evolved in leaps and bounds, to now stand at a reliable point where many are making the move based on the clutter-free experience. At a time when smartphones are freely dropping the grand old 3.5mm audio port in favour of the USB-C port, wireless audio seems the definite step forward. In steps Bose, with the much talked-about QuietComfort 35. The successor to the reasonably successful QuietComfort 25, the Bose QC 35 presents essential refinements to the overall auditory experience. A major part of its reputation has been based on the active noise cancellation that it offers, something that has been rivalled closely by Sony with the MDR-1000X headphones. With more consumers investing actively in premium audio equipment, does the Bose QuietComfort 35 live up to its hype? Put on the Bose QuietComfort 35, and you get a sense of laidback comfort - hence the name. Put it through the paces, and this is where you really feel the comfort of the audio really emanate. Our test tracks include David Sylvian’s Mother and Child, Pink Floyd’s Great Gig in the Sky, Ed Sheeran’s Shape of You, Skrillex’s Kyoto, Flobots’ Rise, Opeth’s Deliverance, John Coltrane’s Equinox, Cream’s Crossroads and Stanley Jordan’s acoustic cover of Led Zeppelin’s Stairway to Heaven. Covering total listening time of over 40 hours, the Bose QuietComfort held wonderful composure of audio delivery, alongside producing beautifully balanced audio. Low frequencies are subtly measured against a sharp mid-frequency performance and controlled highs. Basslines are taut and strong, but recede to the background to provide solid backbones to the instruments and vocals. The mid-lows are well-pronounced, and deep lows sound composed and willowy, which allows the low frequencies to retain great definition. 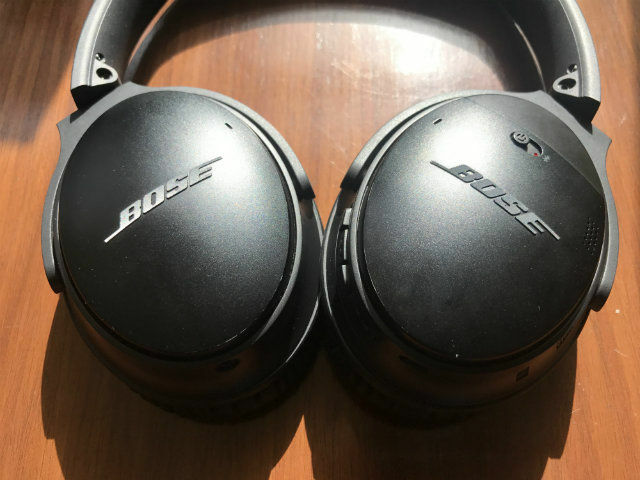 What this essentially means is that you get very good bass performance that does not overpower the rest of the frequency range, as we have previously heard in some of Bose’s headphones. The lows are pronounced enough to please cravings of extra dollops of bass every now and then, and yet are subtle enough to ensure that the mid-frequency body of every track retains ample clarity and emphasis. The clarity here is thoroughly enjoyable, and presents a very comfortable groundwork for prolonged music marathons. Moving on to the mid-frequencies, we only wish that the mids had a bit more emphasis. The audio depth is satisfying, and not for once do songs lack composure. Sudden changes from the pleasant baritone of David Sylvian to Clare Torry’s soaring high pitch does not sound disorienting. Instead, the Bose QuietComfort 35 presents excellent depth in vocals while retaining clarity and emphasis on the bodies of the songs. The mid frequencies are also very true to source, but is not emphatically dynamic. The focus on the comfort of listening leads to slight dampening of vocals in tracks like Uptown Funk by Bruno Mars, where you wish for more excitement in the vocal reproduction. The controlled audio delivery also tends to feel a tad conservative, and is best left to subtle vocals rather than eccentricities of the likes of Robert Plant and Tarja Turunen (of Nightwish). Vocal pitch is spot on, but expressions here are held back to ensure pleasant hours of listening, rather than rage-inducing dynamism. The controlled peppiness of audio is not bad in any way, though - it ensures that you simply put on the QC35 and let your playlist roll. You will absent-mindedly find yourself in sync with the tracks, which proves to be good enough for most listeners who are not massively inclined towards harsh genres. The highs are the star of the show. Pleasant, controlled and precise, each note in the high frequency range sound precise, full, warm and very well-balanced. This adds further definition to songs, where tracks sound sharp, although the highs do slightly overpower the mid frequency range. This becomes particularly evident in heavy metal tracks, although the precise highs lead to sharp details in tracks, which is highly enjoyable. The entire frequency range is very tightly knit, and the warmth in audio reproduction makes tracks sound full, and add to the comfort. Further adding to it is superior audio capabilities is good soundstaging, which provides an expansive listening field and negates notions of claustrophobia that many incur in active noise cancellation headphones. You get good audio distribution, which does not make the sound feel channelled. To sum up, the Bose QuietComfort 35 produces well-balanced audio with defined lows, solid mids and precise highs, although the emphasis on the mid-frequency range could have been a bit better. Expansive soundstaging further adds to the experience, and the tightly knit sound is a joy for any audiophile. Add great clarity on top of this, and you get what is one of the best audio performances from wireless headphones till date. The active noise cancellation on the Bose QuietComfort 35 is optimally balanced, and not as sharp as what Sony produces with the MDR-1000X. This is more gradual, and does not seem like a practical barrier between the ambience and you. The active noise cancellation works particularly well when you are on call, improving in-call audio clarity significantly by blocking out neighbouring chatter and wind noises when you are on call. Even when you are listening to music, the active noise cancellation here produces a good theatrical environment rather than cocooning you out from your surroundings. It is not as intuitive as the Sony MDR-1000X that adds a voice pass filter and an ambient sound mode that still sound rather artificially produced (the telephone voice effect, as we call it), but gets the job done well when you wish to isolate yourself out for an hour or two. 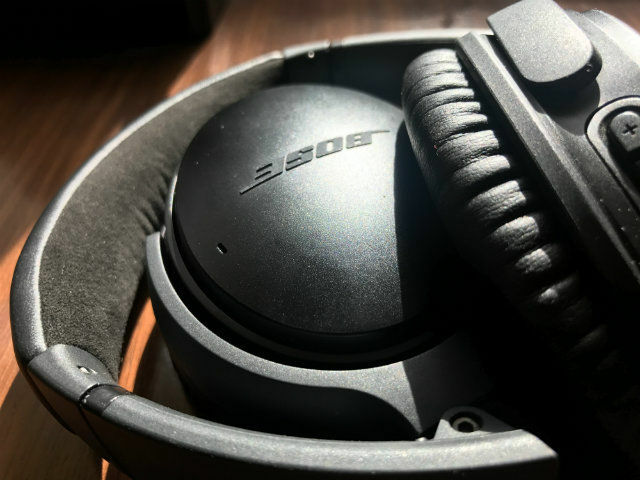 As with everything about the Bose QC35, the emphasis is on comfort, and the active noise cancellation here works wonders. The Bose QuietComfort 35 essentially retains the design of its predecessor, improving on it incrementally. The body is fairly lightweight, although is heavier than the QC25 of yesteryear. 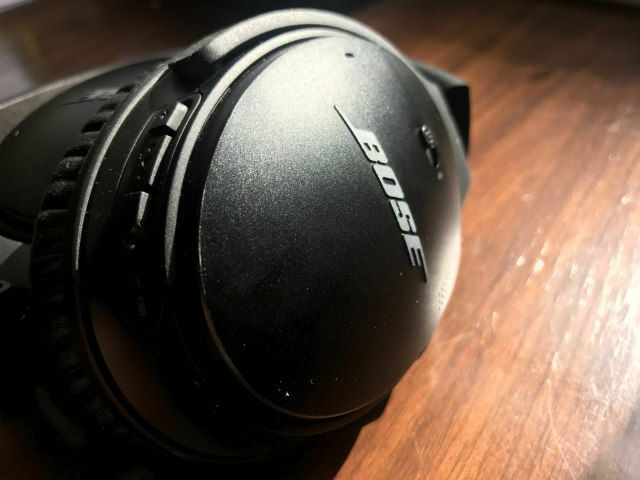 The extensive use of plastic coupled with metal inlays inside give you a wider headband, and add a touch of robustness that will encourage you to go anywhere with the Bose QC35 without needing to be over-cautious of sustaining incidental damages. The fairly simple design feels fairly upmarket, although it does away with glossy ivory or rexine makeovers that the likes of Sennheiser and Sony have added to their offerings. This makes the QC35 appear simple, but it works in a pleasant, aesthetic way, and many would find its design quietly appealing. The right earcup houses the power/Bluetooth toggle, along with three buttons that control pause/play, rewind/back and forward, along with volume and call accept/reject functions. 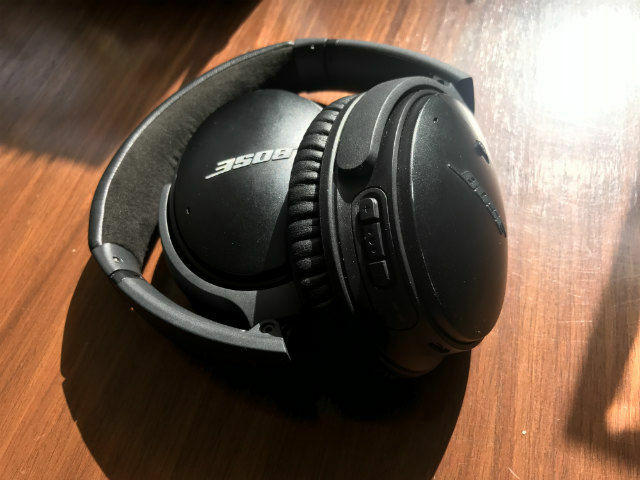 The Bose QuietComfort 35 retains connectivity well up to 40 feet, which is good enough for a pair of personal headphones. Connectivity retention is solid, and you can connect up to two devices simultaneously and jump between the two as needed. 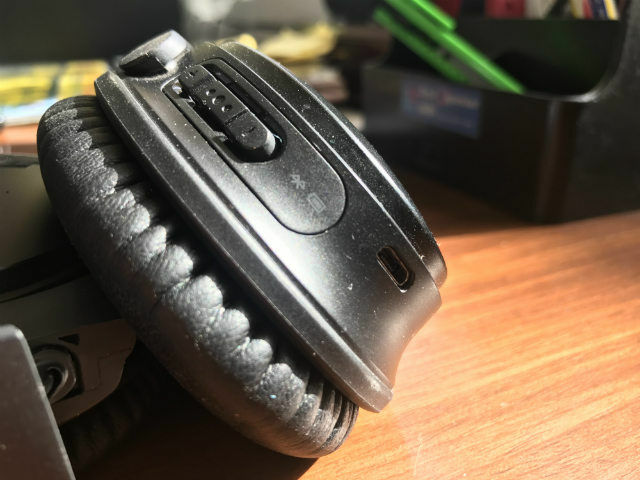 You also get a 3.5mm audio port for wired connectivity, and Bose includes a physical cable in box for continued listening if and when you run out of power on the headphones. Looking at its playback life of 10 hours and 48 minutes that we obtained, you should not run out of charge abruptly, and this should ideally last you for the entire work week of five days as long as you do not leave it switched on for long durations. The battery power indicator is easily accessible with the power toggle, which is yet another neat addition to the Bose QuietComfort 35.